NORWICH, CT- The New York-Penn League has announced the Connecticut Tigers have been selected as the league's nominee for Minor League Baseball's Charles K. Murphy Patriot Award for the second consecutive season. The award began in 2016 and is presented annually to one Minor League Baseball club or individual employed by a club for outstanding support of and engagement with the United States Armed Forces and veterans, both at the ballpark and in the community. The award is named for longtime Florida State League President and U.S. Army veteran Charles K. Murphy, who passed away in February of 2015. A retired Lieutenant Colonel after 21 years in the U.S. Army, Murphy broke into professional baseball in 1975 and led the Florida State League from 1990 until his passing. 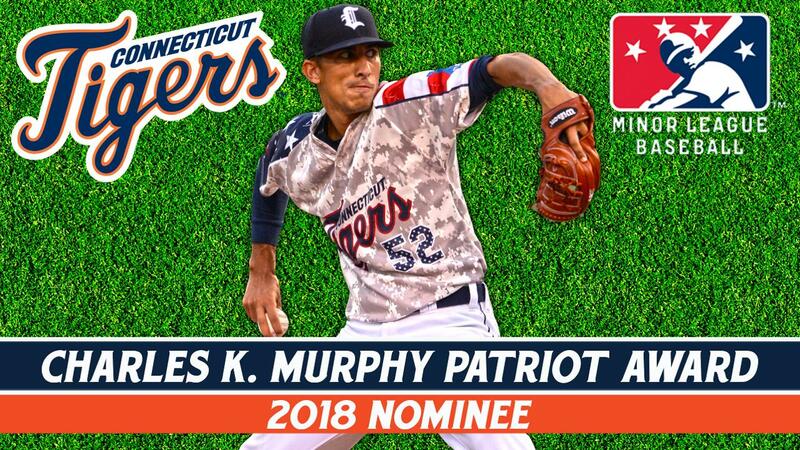 The winner of the Charles K. Murphy Patriot Award will be announced at the annual Baseball Winter Meetings Banquet, December 9th in Las Vegas, Nevada. "It is a great honor to be selected for the second consecutive season as the New York-Penn League's nominee for this great award. We take tremendous pride in our programs designed to honor and thank the men and women of the Armed Forces," said Connecticut Tigers General Manager Dave Schermerhorn. "Especially given our close proximity to multiple military installations we feel it is of the utmost importance to make these brave individuals feel welcomed and appreciated." Some examples of work done by the Tigers to thank and honor the military in our area include a $2 discount on all tickets for every home game with military ID as well as inviting veterans to Dodd Stadium each Veterans Day for a tour of the stadium and a pair of free tickets to a game the following season. Each season one Friday home game is Military Appreciation Night presented by the Better Business Bureau Military Line. All current and/or former military members and their guests can receive a ticket and food voucher redeemable for a hot dog, bag of chips and bottled soft drink all for just $7. In addition, Military Appreciation Night includes the celebration of the CT Military All-Stars program. Fans in the community are asked to submit their nominations for their Military All-Star. A panel of judges then select nine nominees to be honored on the field prior to the annual Military Appreciation Night. In addition, the nine honorees are featured in a baseball card set given away to the first 1,000 fans through the gates that night. The Tigers also helped to raise funds for military families through the auction of game-worn military themed jerseys from Military Appreciation Night, benefitting the Better Business Bureau Military Line Student Ethics Scholarship. "The Connecticut Better Business Bureau's Military Line program seeks to equip those who serve, and their families, with the tools they need to navigate an ever-changing and often complex marketplace," said Better Business Bureau Serving Connecticut Director of Marketing, Communications and Community Relations Jackie MacKnight. "Working with the Tigers over the last five seasons has allowed us to raise monies for our college scholarship fund, awarded annually to the child of a military family." The Connecticut Tigers are the New York-Penn League affiliate of the Detroit Tigers at Dodd Stadium in Norwich, Connecticut. 2019 season memberships and team merchandise are on sale! The front office and box office is open daily from 9 am to 5 pm Monday through Friday and can be accessed in person or by calling 860-887-7962.